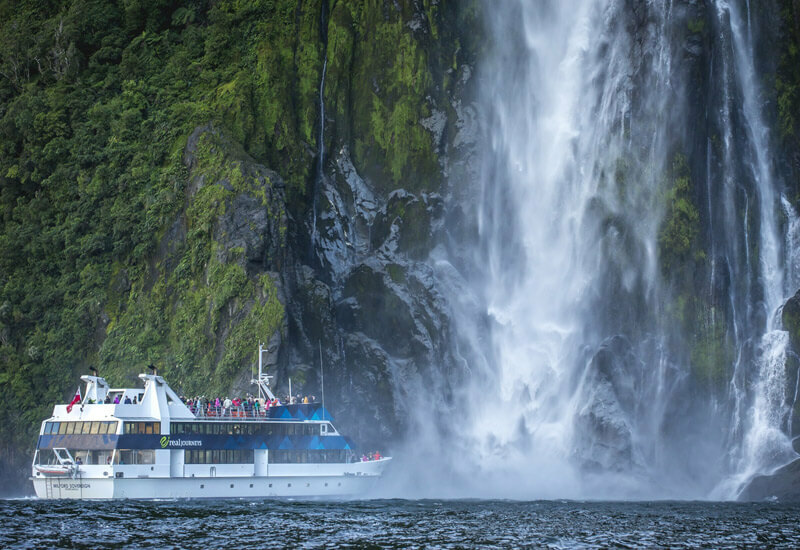 is the ultimate way to see Milford Sound. 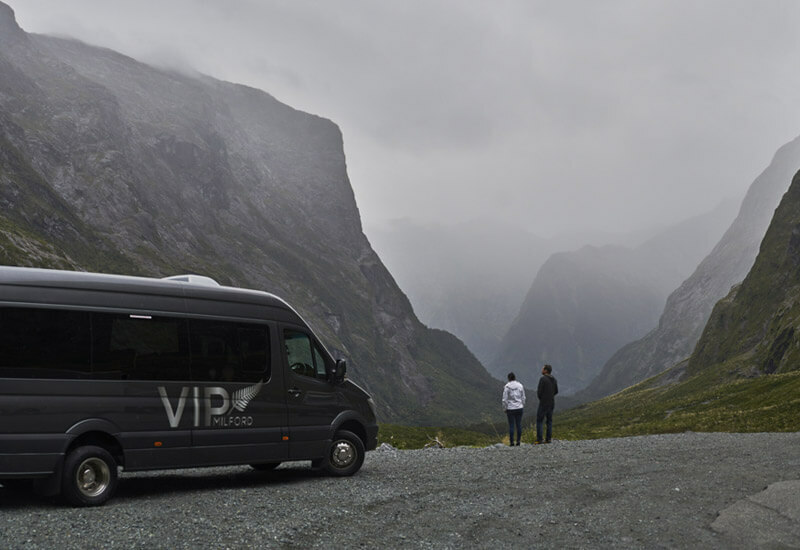 VIP Milford all inclusive Bus Tour is the ultimate way to see Milford Sound. 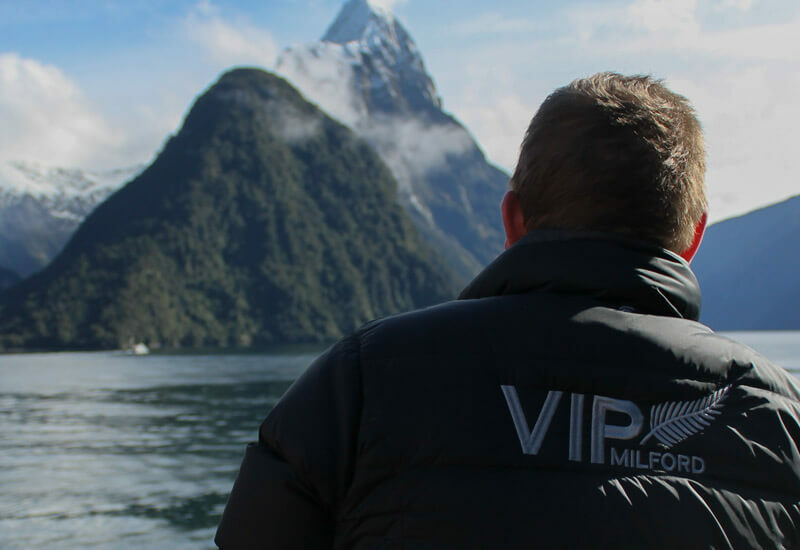 We want to share with you what we think is the ultimate way to see Milford Sound! 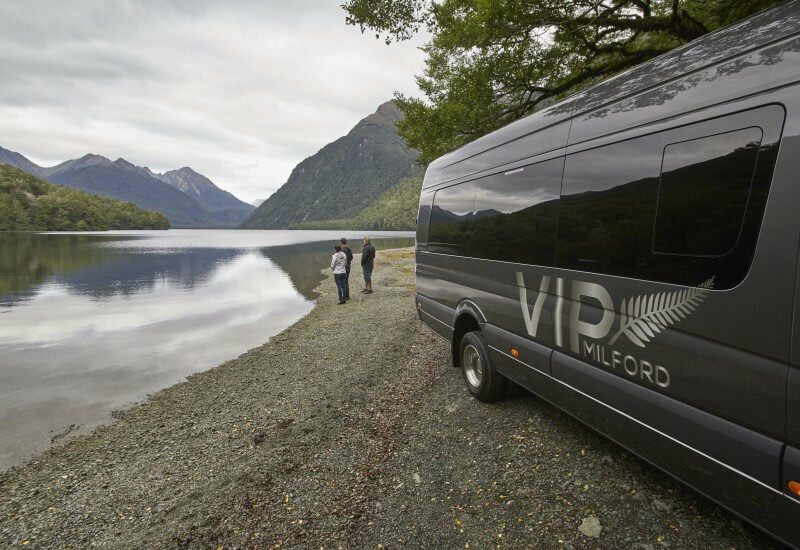 Travelling in a luxury Mercedes coach to Milford will ensure comfort throughout your journey. 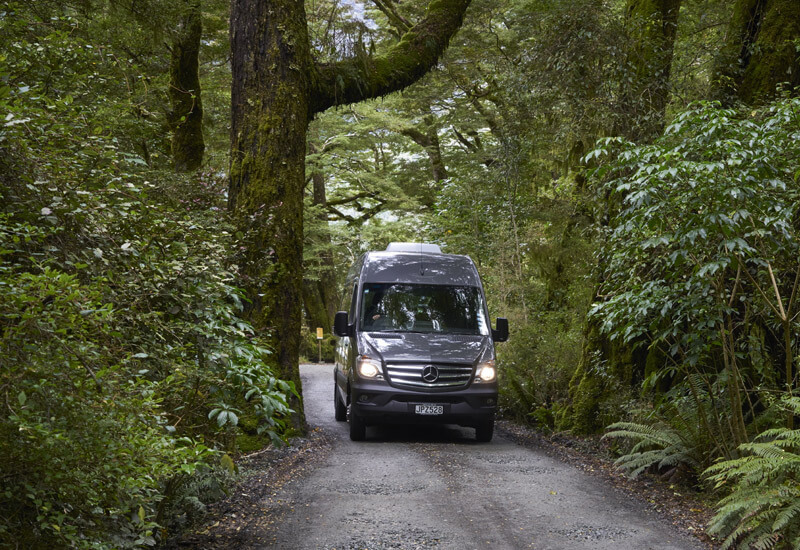 Our drivers are all locals so besides the photo highlight opportunities and popular short walks, you will be treated to stops in hidden places few tourists get to see. An informative commentary will be provided throughout your trip. 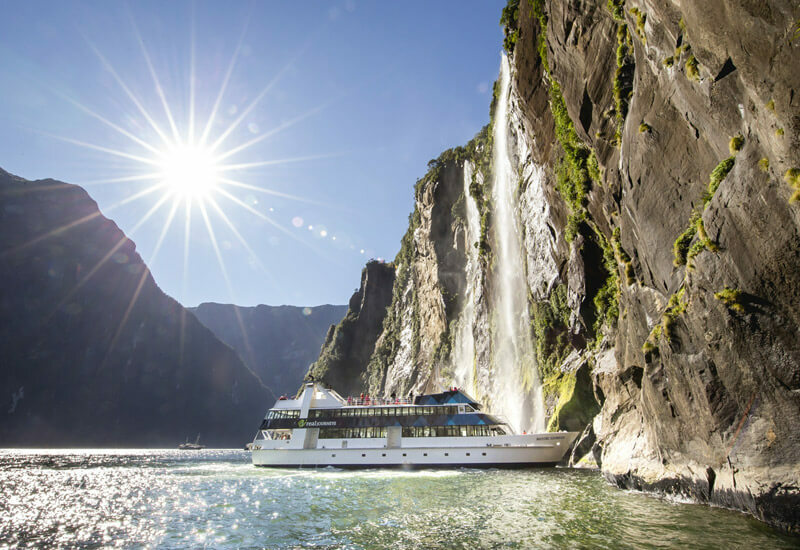 As a VIP Milford passenger you will join a spectacular cruise with Real Journeys in Milford Sound where you get to see the extreme beauty of the sheer granite cliffs, rushing waterfalls and the incredible Mitre Peak. 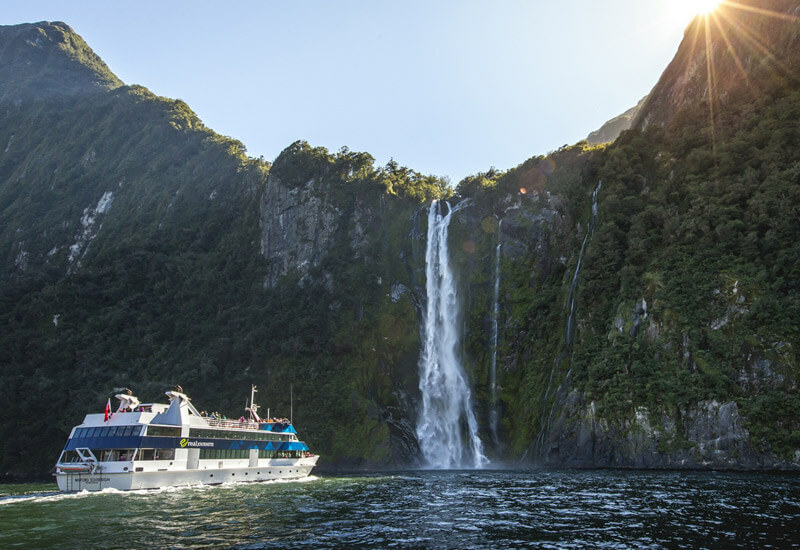 Your cruise will get you up close and personal with waterfalls, seals and if you are very lucky, dolphins! *Children aged 4 - 14, infants aged under 4 Free. TOP 10 members receive a 10% discount per adult & 5% discount per child. 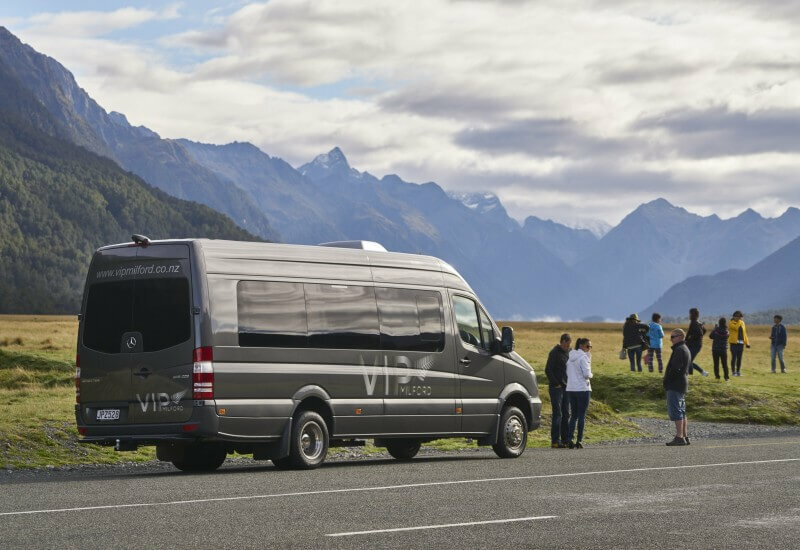 Travel in luxury and ultimate comfort in our 18-seater Mercedes coach. 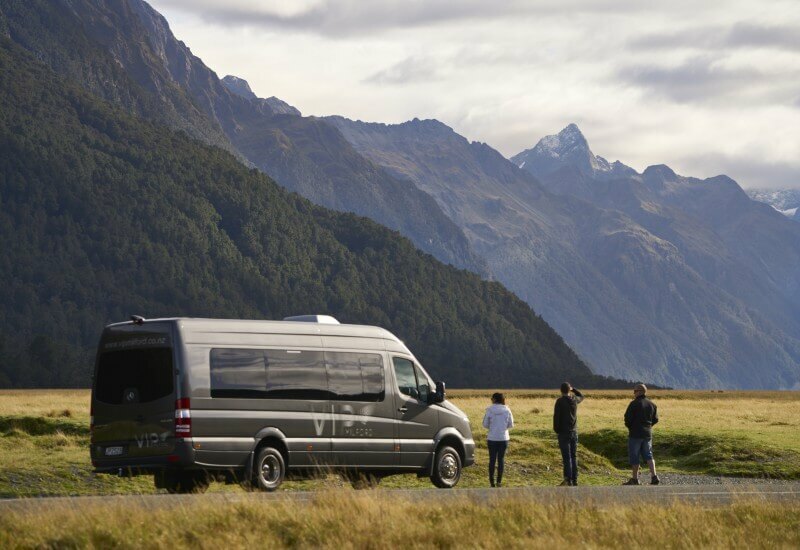 With air conditioning in Summer and heating in Winter, you will be comfortable taking in the spectacular scenery through extra large viewing windows. 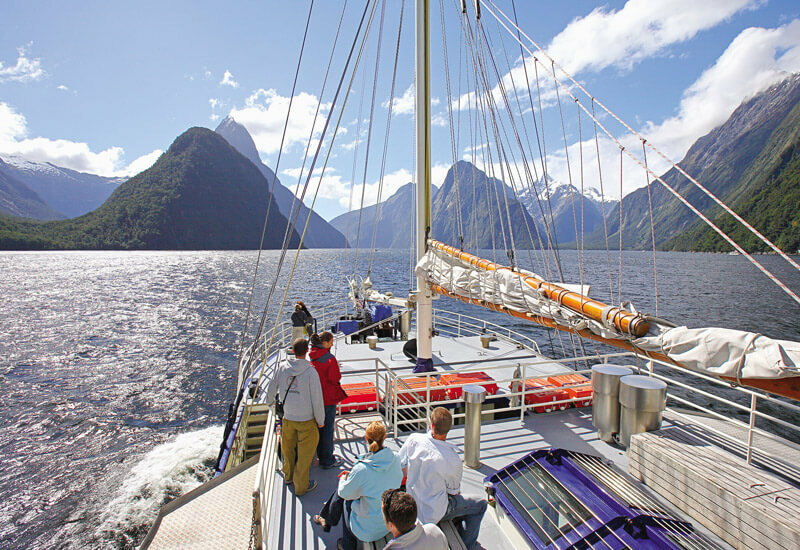 The small seating capacity allows for more time do extra photo stops and small walks on your trip to Milford Sound. Passengers will be treated to an informative and insightful commentary throughout the journey. 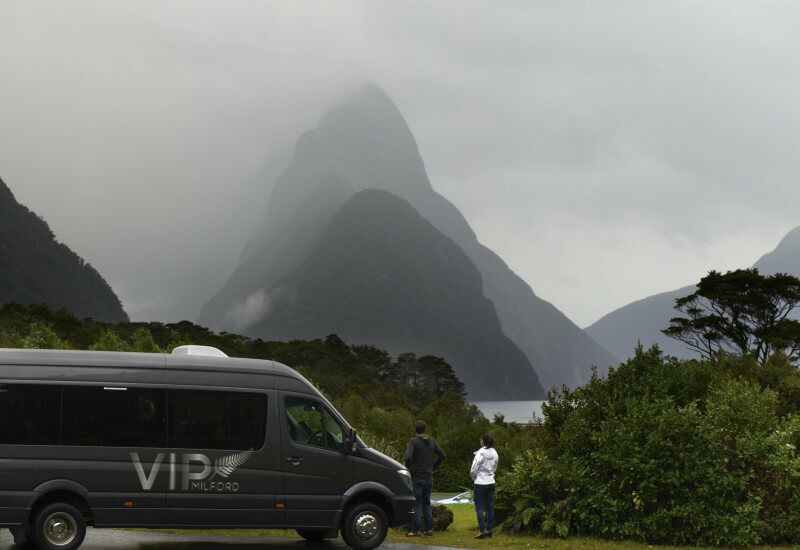 Having a local driver is an important difference for us as there are many insider tips for places to stop along the beautiful road to Milford Sound. 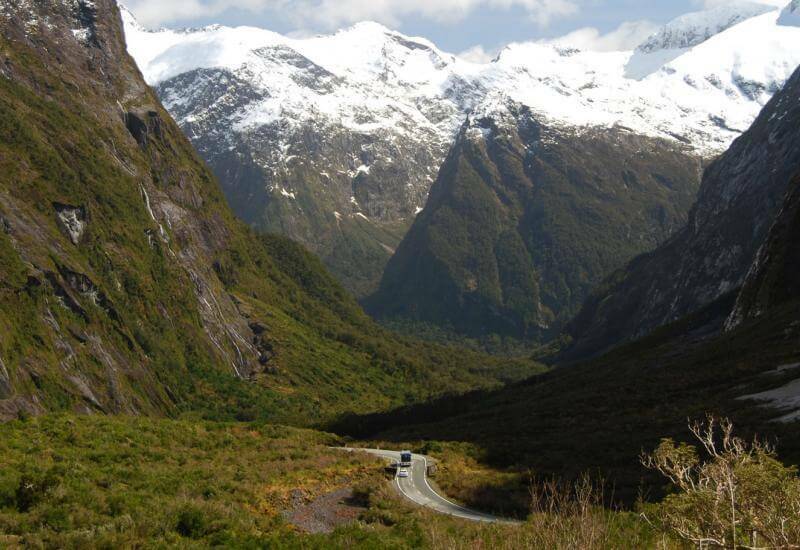 Take in the spectacular alpine scenery at such places as Mirror Lakes, Knobs Flat, Eglinton Valley, Pops View, Monkey Creek, Homer Tunnel and The Chasm. In Milford Sound you are able to join either a Scenic or Nature Cruise with Real Journeys. 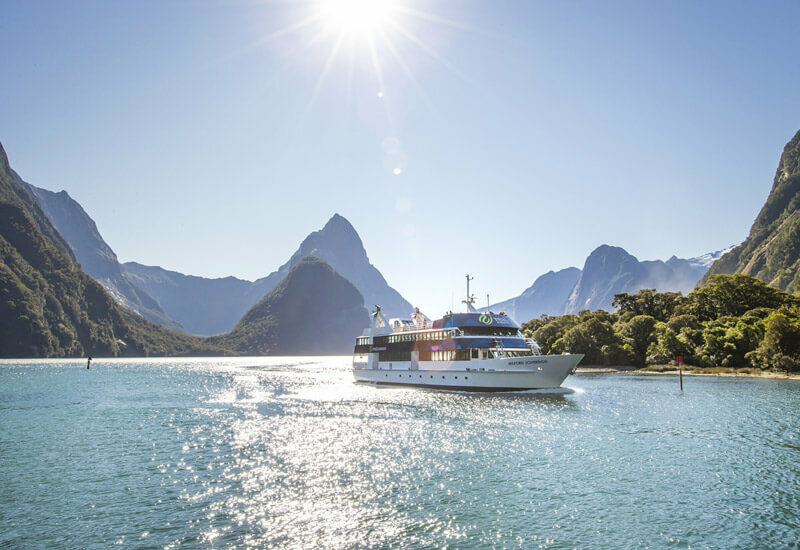 Passengers will enjoy Milford Sound’s awe-inspiring scenery from the comfort of modern vessels. Viewing decks and observation lounges are purposely designed and the boat will even go right under the waterfalls! 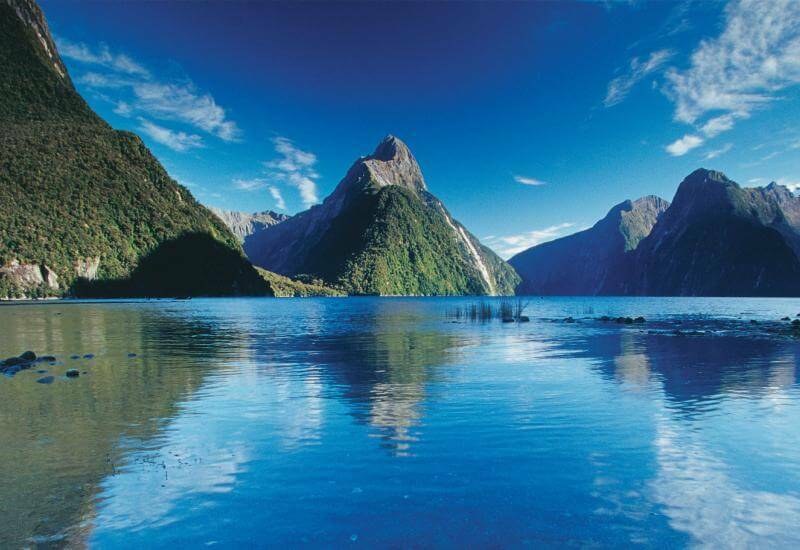 Milford Sound has been dubbed the 8th wonder of the world and is easily one of the most beautiful places on earth. 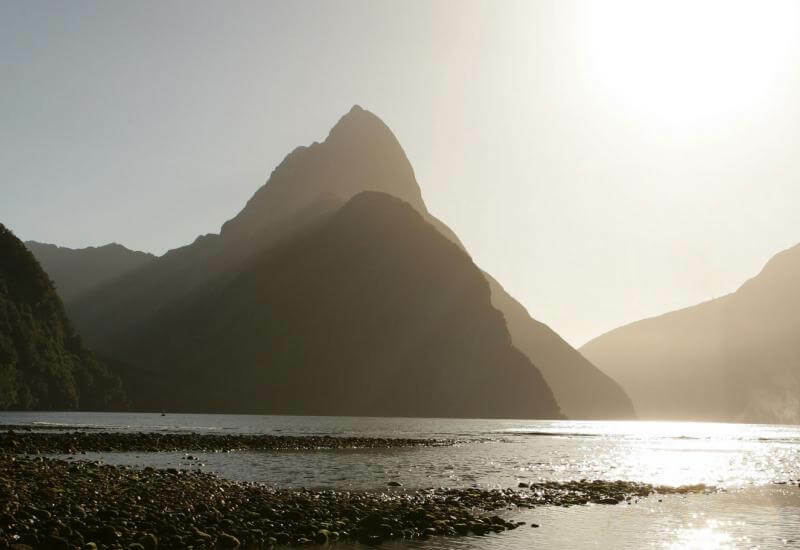 It is the home of the iconic Mitre Peak which towers more than a kilometre straight out of the water. 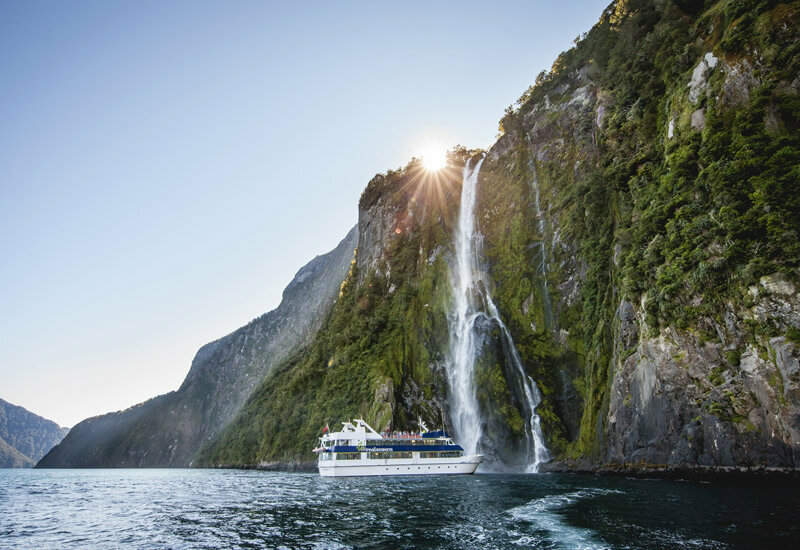 Towering cliffs and peaks are decorated with cascading waterfalls, all surrounded by luxuriant rainforest. 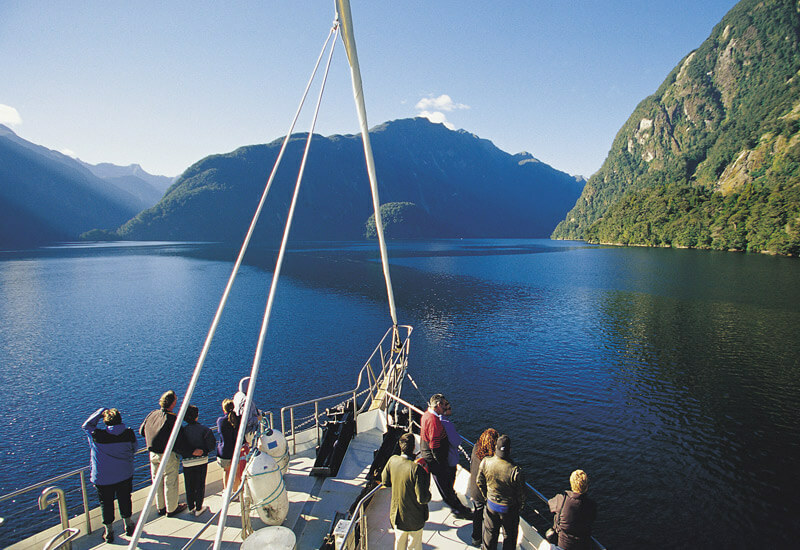 Though Milford Sound is only 125km from Te Anau, the driving time each way is 2 and a half hours. 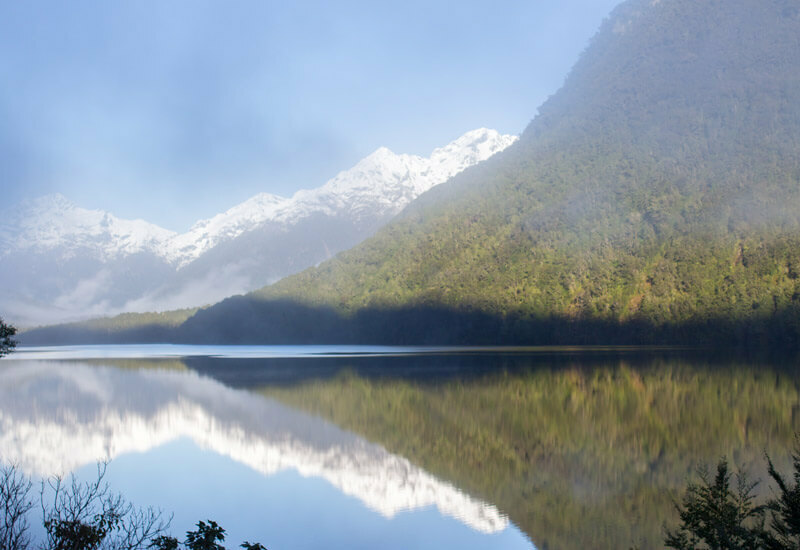 You will need to allow a full day to visit the Sound, and we recommend staying in Te Anau the nights either side of your trip. 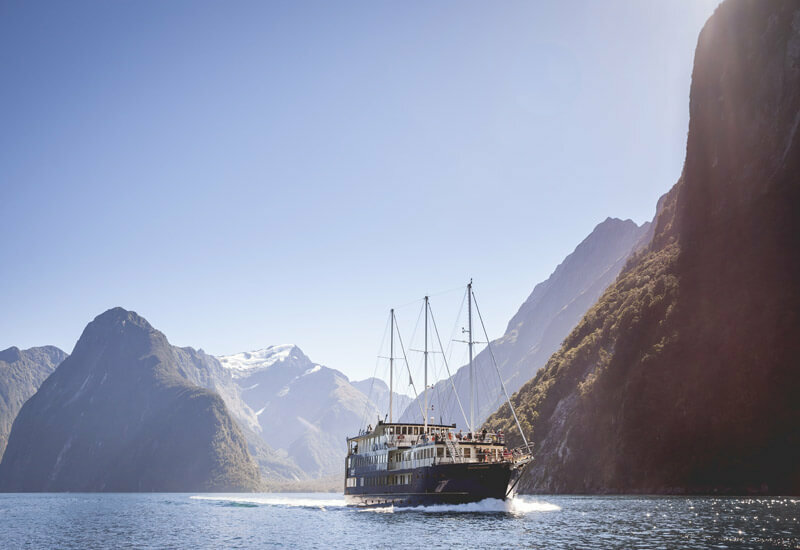 The journey to Milford Sound is spectacular in its own right with many extraordinary places to stop for photos or walks in the Fiordland National Park. 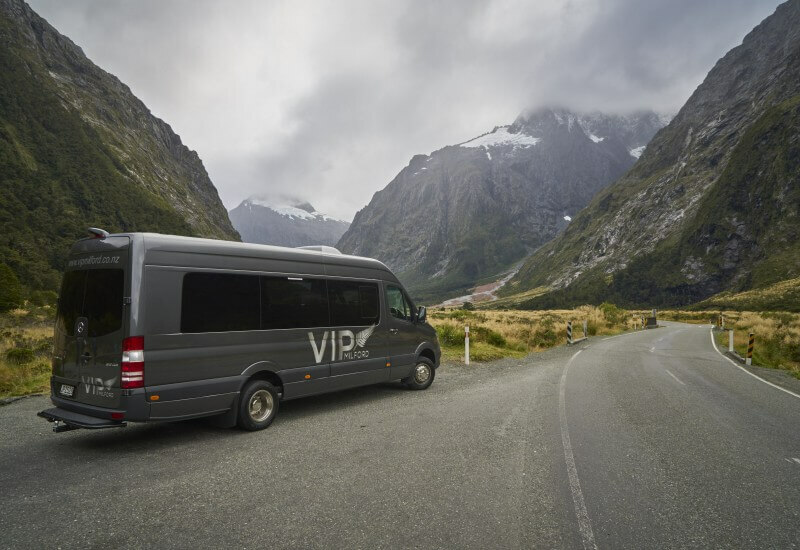 There are many places locals recommend taking time to stop at, therefore we recommend sitting back and relaxing in the safe hands of a local driver to show you their favourite sights and manouver the challenging road safely. 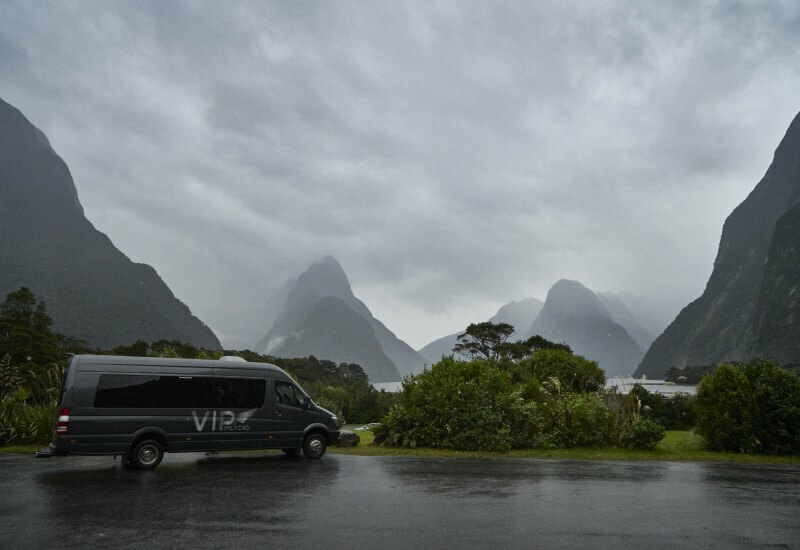 It rains on average 182 days a year in Milford Sound, with an annual rainfall of over 6m, but do not let this put you off. 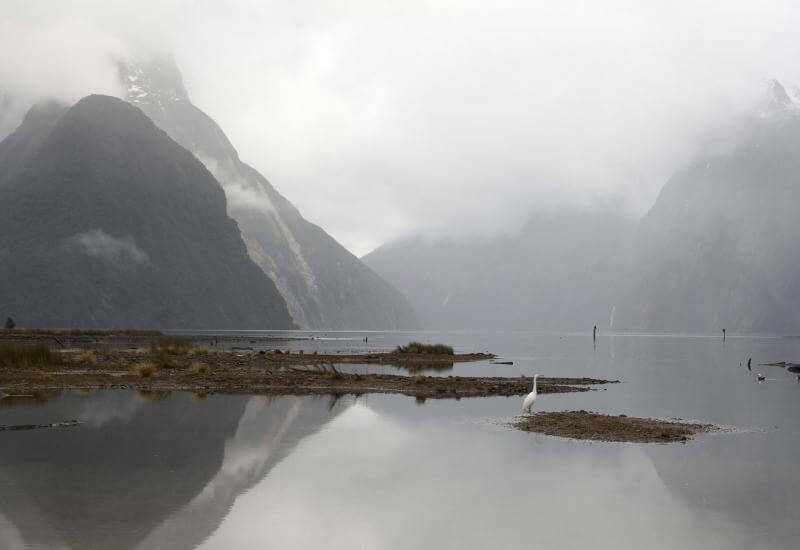 Ask any Fiordland local and they will say they prefer to visit Milford in the rain. Rainy days can see the 2 permanent waterfalls increase to over 500! 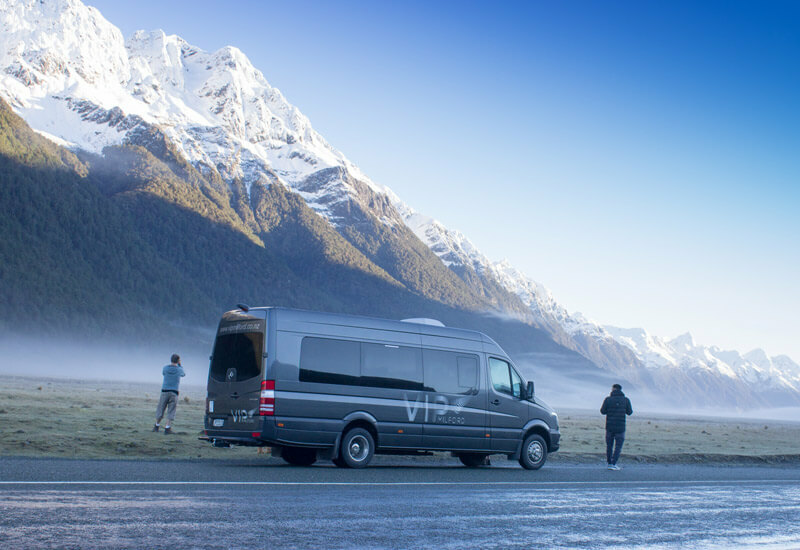 The snow capped mountains in Winter make for as stunning photographs and memories as blue sky sunny days. No matter what weather mother nature serves up you will without a doubt feel like you have entered another world. 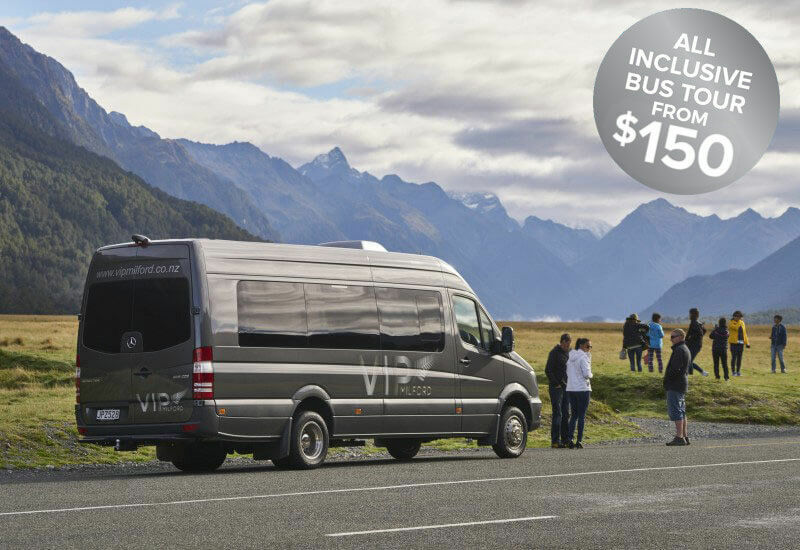 We know travelling with kids can be expensive! 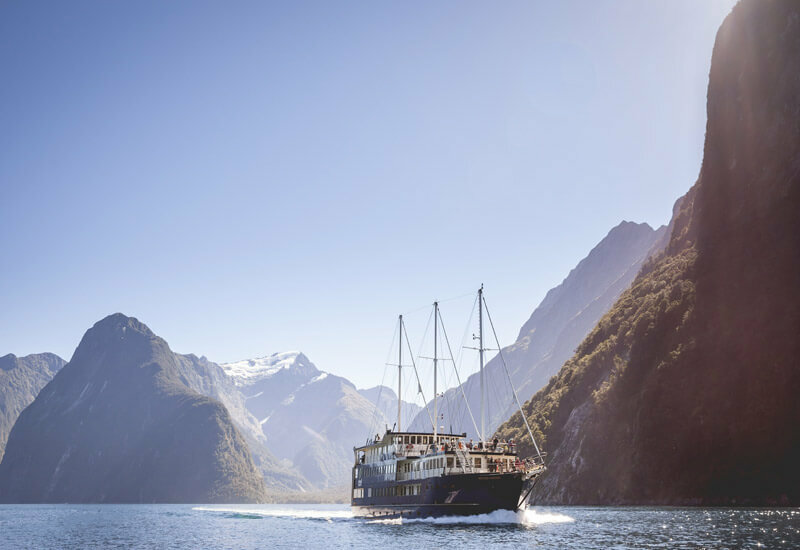 Take advantage of our special offer in the New Zealand School Holidays where children aged 5-14 years old travel half price! 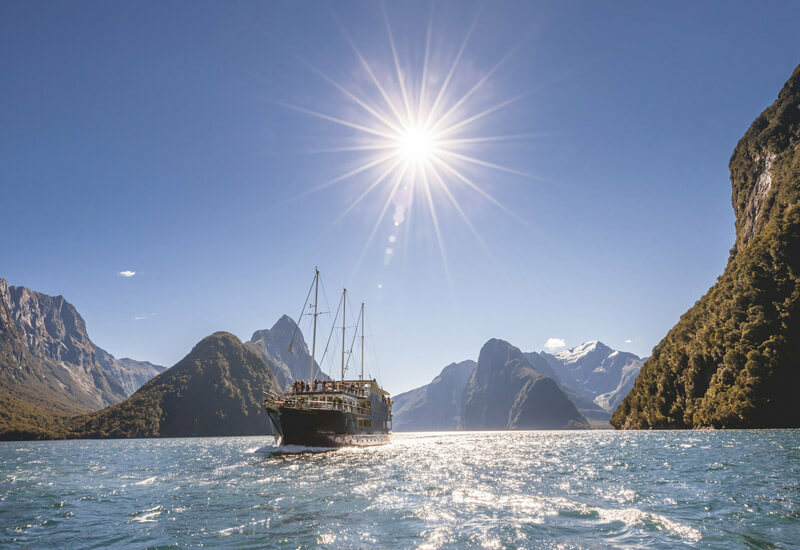 Have a look at some of the spectacular scenery you will see on our tour and also watch our video to give you a full flavour of this magical experience. You can browse our Instagram feed below. Read a selection of our recent reviews from previous customers. 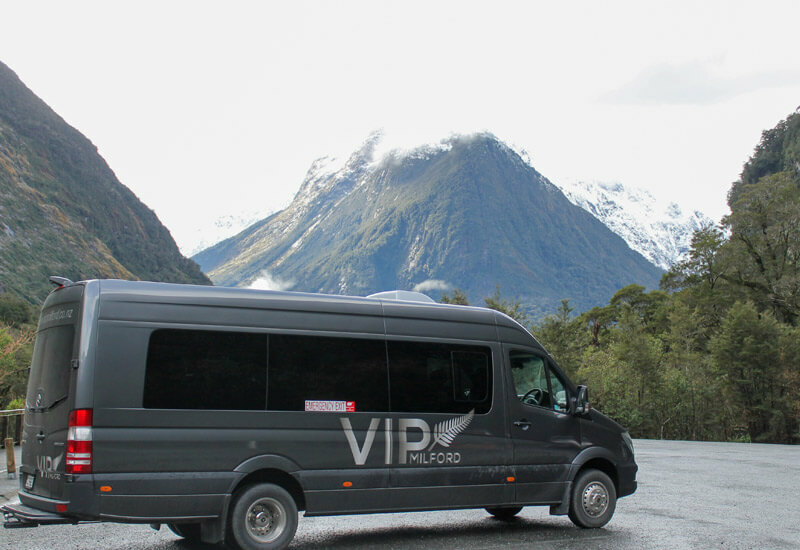 "VIP Milford is the Best"
From the moment Justin picked us up at 8am at the Te Anau Kiwi Holiday Park where we were staying until he dropped us back at 4pm, we were given the best service that you could hope for and VIP Milford made it a day to remember! 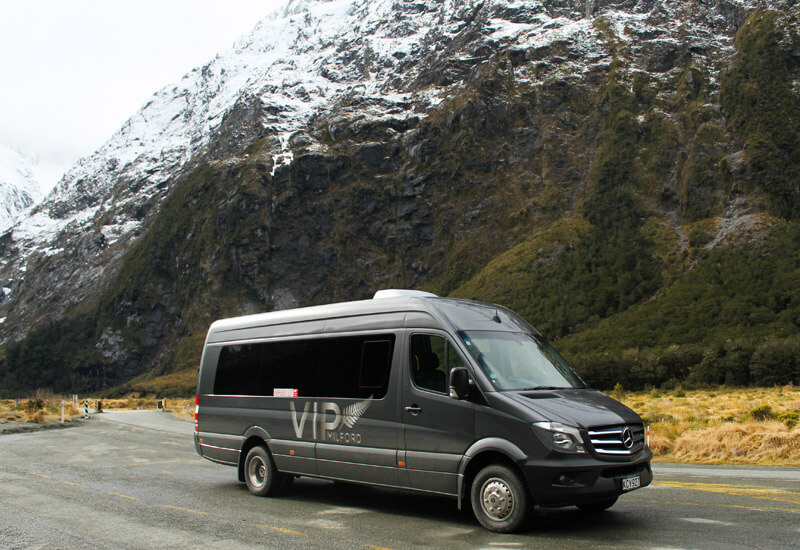 We were picked up in a very comfortable Sprinter Van with comfortable leather seats and on the trip to Milford Sound we were given a bit of local history and a great commentary about the places we were travelling through. 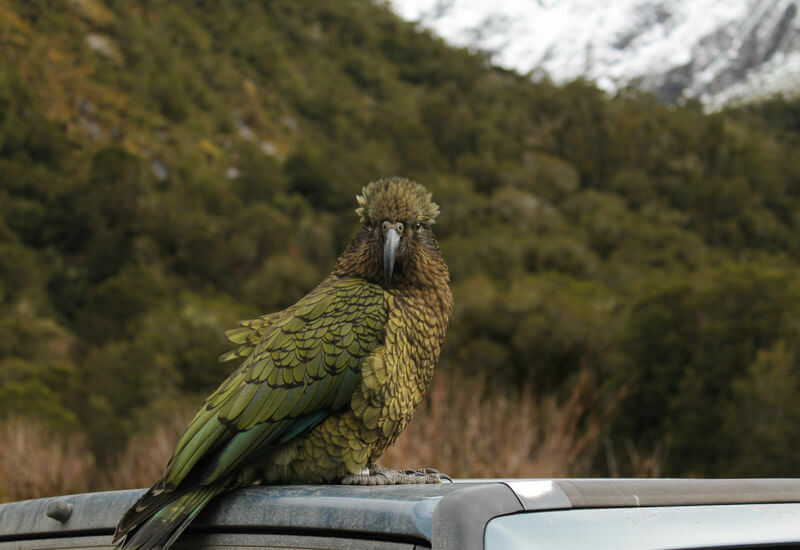 We made a number of stops along the way for photographs at notable places like mirror lake, the chasm, each side of the Homer Tunnel and the great toilet facilities at Knobs Pass along with many others. 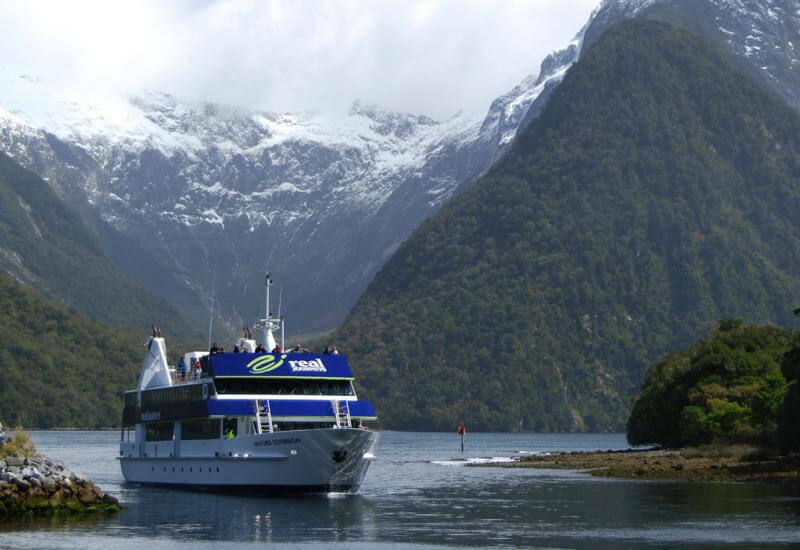 At Milford Sound Justin picked up our tickets for us and showed us where to wait to board our buffet lunch cruise on Real Journeys Milford Sovereign on which we had a reserved table, but were free to move around. 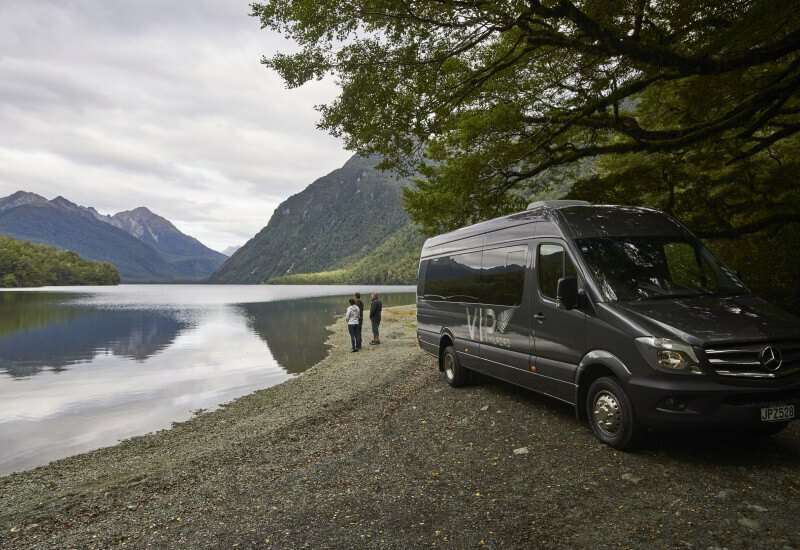 We then got back on the bus and were taken back to Te Anau with a few stops Along the way. Thank you VIP Milford for a wonderful day. I have no hesitation in recommending VIP Milford to anyone!!! This beats driving the 2 hour plus drive yourself. A beautifully fitted out Mercedes bus, with knowledgeable commentary provided by the driver; and enough stops for the photographers among us. 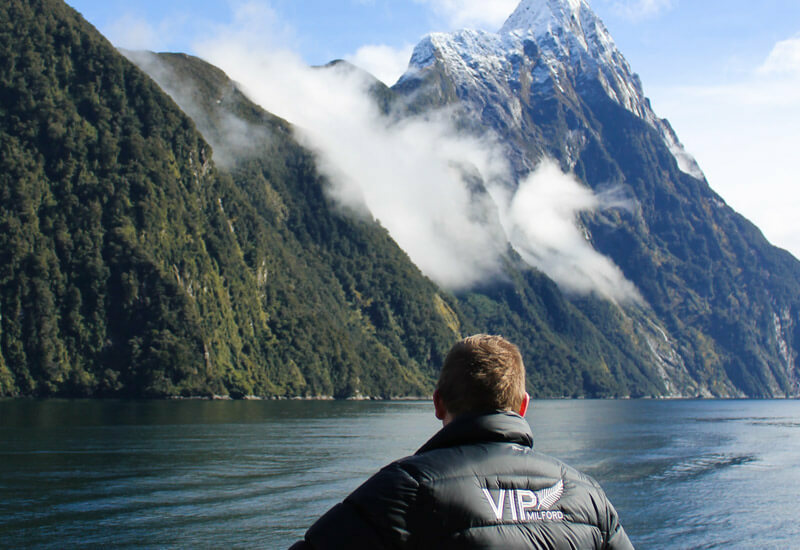 "VIP by name, VIP by nature - treat yourself !" We planned to travel to Milford on a day when the weather was good, however the day we chose had a higher risk of avalanche. 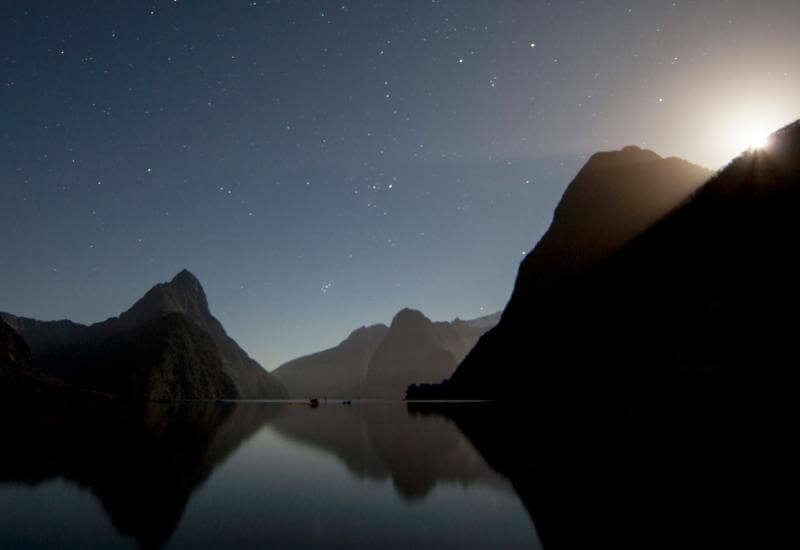 The road was closed 'until midday at the latest' according to the official NZ website. Justin was our driver for the day and he met us all at 08:00 as planned and informed us of the situation, and that we would reconvene at 09:00 to assess the situation. Back at 09:00 and we were off, with the assurance that if we got to the gates and they were closed for the day we would get a full refund. We made it through as the avalanche risk was reduced. No delay and no waiting - again underlines why you should choose a smaller provider. The trip was excellent, with detailed and informative commentary from Justin. He had specific local knowledge and could respond to questions from the small group. This is the advantage of travelling with a local company and in a small luxury vehicle. 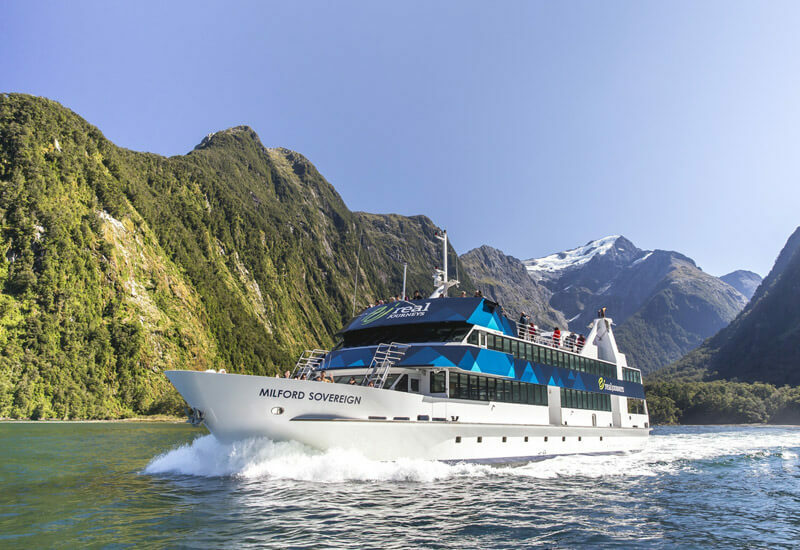 Our trip could be adapted as circumstances allowed - in our case we had more time to look at the specific attractions on route to Milford Sound. 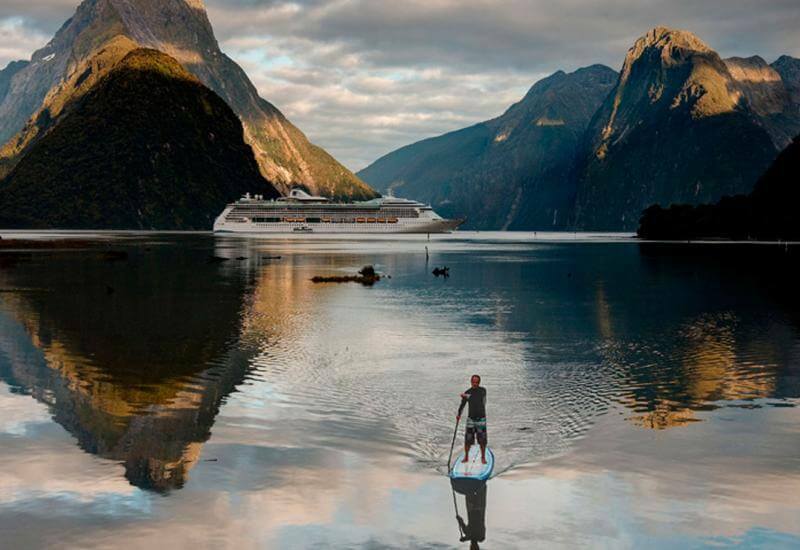 Justin had already re-assigned our booking for the cruise and gave us advice on the sights. The trip back could be altered to ensure we arrived back at Top 10 around 17:00 which again shows the flexibility of using a small, custom service, rather than the big coach providers. 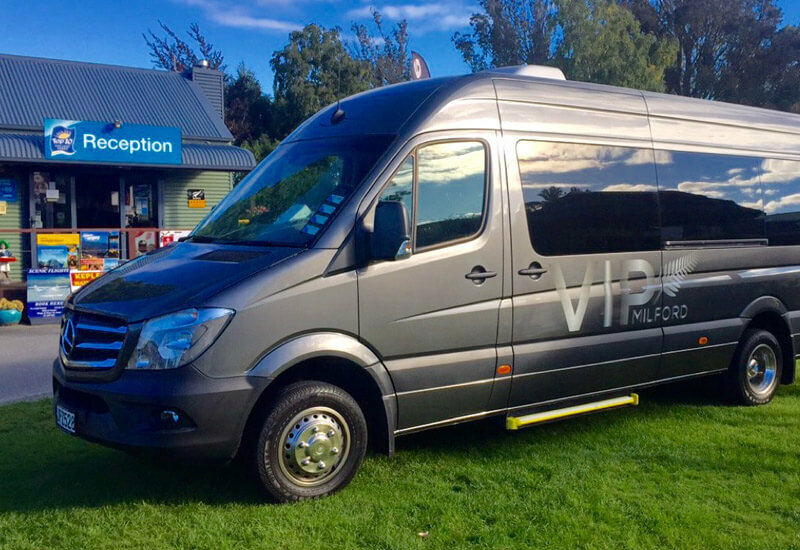 Choose VIP, they are excellent, professional, flexible. Justin, sir, you are a diamond ! Everything turned out perfect, the guide was super friendly, the trip there was nice and comfy on the VIP bus, we stopped at some amazing places along the way and had perfect weather the whole day. Highly recommend! 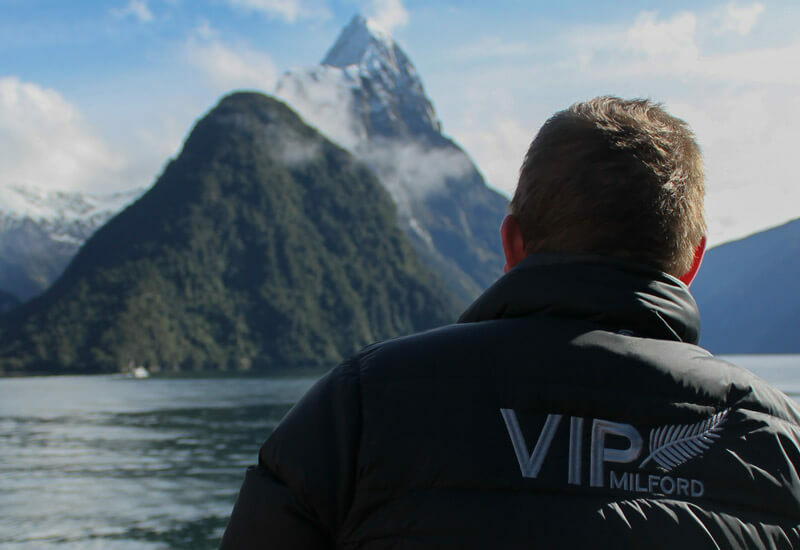 VIP Milford all inclusive Bus Tour is the ultimate way to see Milford Sound. 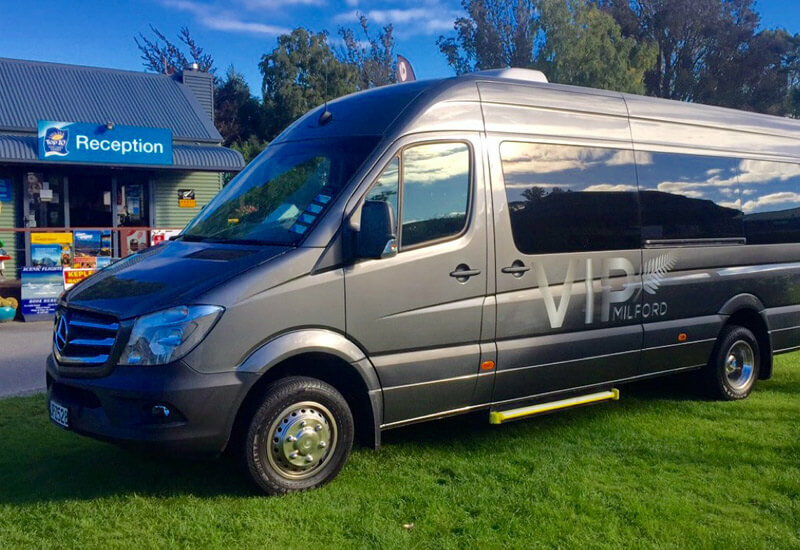 Travelling in a luxury 18 seater Mercedes air conditioned coach to Milford with a local driver will ensure comfort throughout your journey. You will be treated to photo opportunities and short walks that locals recommend, as well as an informative commentary throughout your trip.